It's just like a fairytale, or at least that's how it was for me. I was always busy between dress fittings, manicures, parties, planning for the wedding, and the sheer anticipation of getting married is just blissful. That's why I always encourage long engagements. I mean, who wouldn't want to prolong the sweetness of a time that is so wonderful!? And then we got married. We honeymooned, came home and, to be honest, things had changed. Yes, they changed. Even after seven years of cohabitation, they changed. We were married. It came with a set of expectations, a deeper commitment, and some problems. People who are married who tell you they have never had any problems as a couple either haven't been married long enough, or are just plain lying. The thing is, marriage is wonderful. It's a walk--a journey. But it doesn't come without struggle. It took a couple years to iron out the kinks of our new arrangement. Yes, you read that right, a couple years. Arguably the most challenging two years in our relationship were the first two years of marriage. But iron it did, and while we still get wrinkles here and there, we have found a formula. Funny enough, then, I noticed a similar pattern with pregnancy and parenting. After a few years of marriage, my husband and I decided to take the plunge into parenthood. For me, this was much scarier than getting married, which should have told me something right there. But I was "ready" and committed. When I got pregnant, well, it was sort of like being engaged. People were ecstatic. Over. The Moon. I was surprised, very pleasantly might I add, by other people's enthusiasm because it helped me get excited too (even though I was terrified.) Again we found ourselves planning for a big event. There is a lot to do when you're having a baby. Lots of product reviews to read, things to pick out, and there is, of course, the baby shower, which we made a big fuss over. And then I went into labor. I forgot all about the fear in those moments, I became blissfully excited. Even the first day in the hospital I was overjoyed and filled with a sort of void that happiness (and relief) that a safe birth brings. There she was, all ours and ready to come home with us. The reality of parenting didn't really hit me for probably a couple of weeks. And it wasn't the sleep thing (my daughter is a good sleeper) and it wasn't the breastfeeding thing (also no problem), but it was the enormity of it all that was so overwhelming to me at times. I was responsible....for a person. The thing is, parenting is wonderful, just like marriage. It is it's own kind of journey. But that sweetness of having a child doesn't come without struggle. Those parents who tell you it's without challenge need their heads examined. Of course, it's totally worth it. There are moments when I'm so happy I literally burst into tears. Being a parent has softened me up considerably and I've been surprised about the places in myself I have found. Engagement is to marriage what pregnancy is to parenthood. It's not something that you can fully comprehend unless you've lived it. And certainly, neither marriage nor parenthood are for everyone (which, by the way, is totally cool). Engagement and pregnancy are the fantasies that give way to the realities that shock and amaze us. Sometimes that shock is good, and other times it forces you to dig within yourself and find the energy to go on, the will to compromise, and the wisdom to shut the hell up. At least that's the way it's been for me. How has it been for you? Share your experiences with me in the comments section below! You always hear people throwing around the phrase "it takes a village." When I was pregnant, I was so aware of this phrase, and I vowed to let that village in; you know, in case I needed them, which I thought I might. Boy was that the best decision I've made in a while! As it turned out, I needed the village. It really does take a village. From everything from trying to figure out how to put my breast into my child's mouth when my milk came in (holy hell, those things swell!) to needing diapers and clothes, my village was able to surround my family. The funny thing is, even though I was aware that I wanted to let the village in, I wasn't sure who they were. That is, the villagers I speak of, well, some of them were really surprising! So, I wanted to introduce my village because I love them! My Zumba family has been awesome through EVERYTHING...especially my spotty schedule these days (eek, I swear, I have the best of work out intentions!) But these ladies not only threw me a shower, but also offer support nonstop in the way of advice, gifts, and camaraderie. When I was pregnant, the ladies who work at our local Fulton Bank were soon excited for me. And when Ruby was born? Even more! I have been constantly cheered on by this group of people (mostly women, but there is a guy or two who works there), and it fortifies me. And it sure as heck makes getting to the bank a lot more cheerful. When Ruby was born, I was surprised in the best way when our mail carrier Sharon came up the drive with presents for her. It was one of the sweetest things EVER. She brought outfits and a case of diapers. She totally didn't have to do that, but it reallllllly gave us the warm and fuzzies. Faith in humanity? Restored. This might sound off the wall, but I love these people. I mean, I see them all the time. Plus, I'm freaky about the grocery store--I love grocery shopping! I am always interacting with them about new products, or asking for certain things, et cetera. I enjoy the consistency of seeing them each week and knowing they are there with a friendly smile or asking how we are. And my grocery pharmacist actually knows my name, which I think is just so sweet. So that's my village. And I love them each and every one. I hope I haven't forgotten anyone. Tell me a bit about your village in the comments section below!!! So, I have been doing some catering and personal chef work. It's been a lot of fun. Of course when I started doing it, my mom immediately wanted to support me because she's an awesome mom like that. Every year she has a Christmas party for her office, and this year she asked me to cater for her. It was going to be Asian themed, which normally isn't my strong suit, but lately (because of the dairy free thing) I've found more and more Asian recipe sneaking their way into my repertoire. Back to the cheesecake at hand. I had to come up with a dessert. My mom requested cheesecake, which of course isn't near Asian at all, but then, like a lightbulb going off, I had it: why not make a green tea cheesecake?! 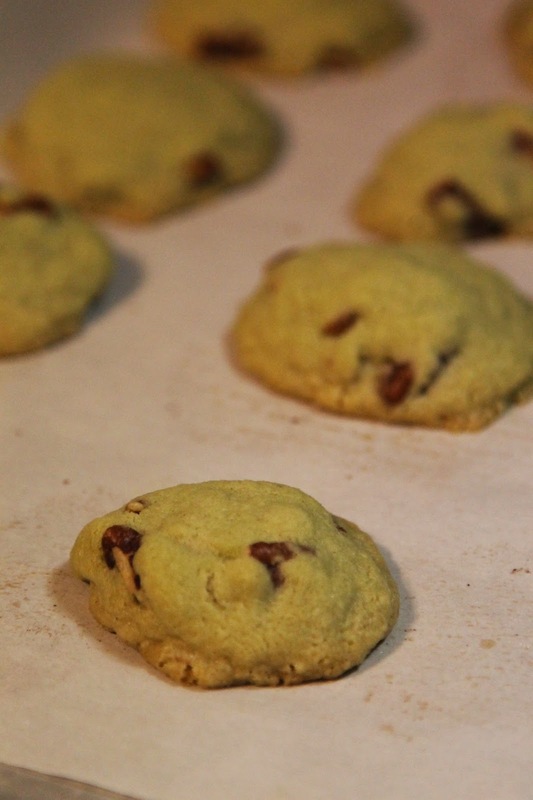 For this, I used one of my favorite little secrets to bake with: matcha! It's green tea powder. Any-who, this dessert will look beautiful on a Christmas dessert table, but also would be wonderful in any season. The flavors lend themselves to any time of year, if you ask me. So let's get to it. Ladies and gentlemen, start your ovens. We're gonna make some cheesecake with a slightly Asian twist. Special equipment: Springform cake pan and a bigger bake pan that will hold it. Take tin foil and wrap the bottom of the springform pan (from the outside) with three layers of the foil. Grease the pan and then press the shortbread crumbs in the bottom (not the sides, just the bottom) of the pan. Set aside. In a stand mixer, mix the cream cheese, yogurt and sugar until smooth. I did a medium (ish) speed. Once mixed, add your eggs, one at a time and vanilla. Once incorporated, go ahead and add your matcha. I found that little beads of matcha stayed in unmixed, and it came out just fine. Just be sure it's about as incorporated as it can be. Pour your mixture into your prepared springform pan. Place that pan into a larger pan and fill it halfway with hot water. Carefully place the cheesecake into the oven and bake it about an hour or until the center moves just slightly. I found it took about an hour an fifteen minutes, but my oven gets a little weird sometimes. When finished, carefully remove the pan from the oven and then remove the springform pan from the water. Place it on a wire rack to cool for one hour and then place in the refrigerator up to two days before serving. To serve: Take the outer ring off the springform pan and place the cake on a serving tray. Slice your mint or tear into "rustic" pieces. Mix with the raspberries and then place the mixture on the cheesecake. Slice and serve! So I had what was one of the worst flu viruses I have had in recent memory. That took up the first portion of my month, and it was not fun, let me tell you. As a result, I didn't get my Christmas shopping done, but I told myself I had plenty of time to attend to all that. Or so I thought. In the short time that I was feeling marginally better from the flu, I had a lot to do; there was a party for my father-in-law, and that week, I did a ton of cookie baking. That week, (last week) I also catered my mom's office Christmas party, which was a lot of fun. 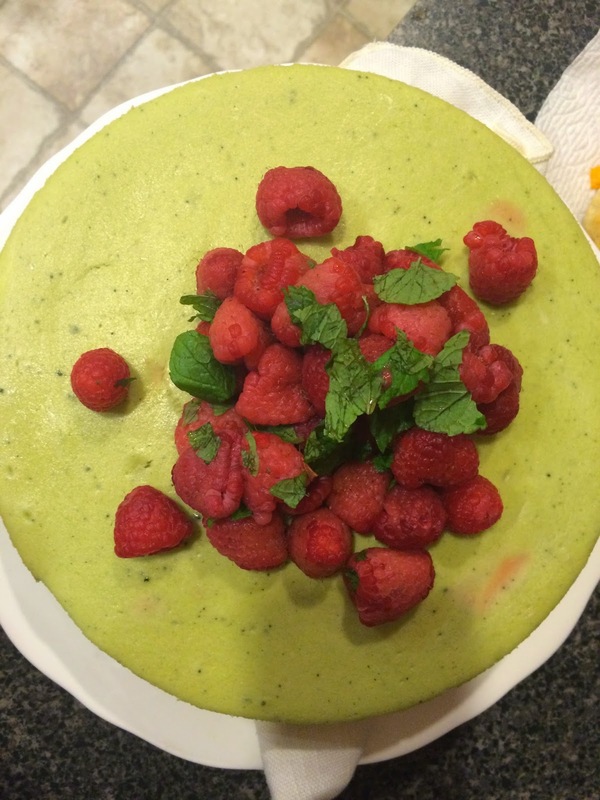 I've got a recipe for a green tea cheesecake coming up that is to DIE for!!! Anyway, there we were, shooting my daughter's seven month picture in the middle of an already hectic week, when my girlfriend and husband said, "Hey Billie, you've got a weird rash." I didn't feel a rash of any sort, so I was really surprised. I had a swollen lymph on my groin, which I thought was from me being sick the week before, so I just ignored all of it. Until I couldn't. The rash came on Friday, and by Sunday, my hip was a lot of really weird pain, and that rash? Well, it was really not looking any better, in fact it was looking worse. It wasn't until Monday morning that I knew I had to go to the doctor...and by then I had (with the help of google) put together all these symptoms to decide I had shingles. At first I thought I was batty....how could I have gotten shingles? But no, I was right, I did have it, and my doctor confirmed this. Apparently sometimes when you get the flu, it knocks down your immune system soooo much that you get shingles. Shingles lives in your body if you've had chickenpox before. I couldn't believe it. The way my symptoms presented was a little strange to me, but hey, I've never had shingles before, so, go figure. Luckily it's not contagious as long as no one touches it. I have to keep it covered with clothing, which really isn't difficult. It is painful, but it's not unmanageable, so I'm thankful for that. Doctor says in a week or two I should be good as new. I'm over the whole "being sick thing," but I guess my body hasn't gotten the memo yet. I wonder if breastfeeding is compromising my immune system, but I am determined to keep it up! It's hard for me, clearly a type A personality, to rest. And I had done such a good job of resting while I was really sick, but I was ready to kick my holiday into high gear here. It's just not going to happen. It's more rest and staying home. No workouts (my doctor's orders....sheesh). No physical exertions. So it's back to bed I go. These days I feel like I can't catch a break from being sick...which is SO not me! Ah, well. So there it is. I got shingles for Christmas. Sometimes you just get a hankering. And for me, it was cookies. I wanted to make some nondairy chocolate chip cookies. That was well over a week ago. 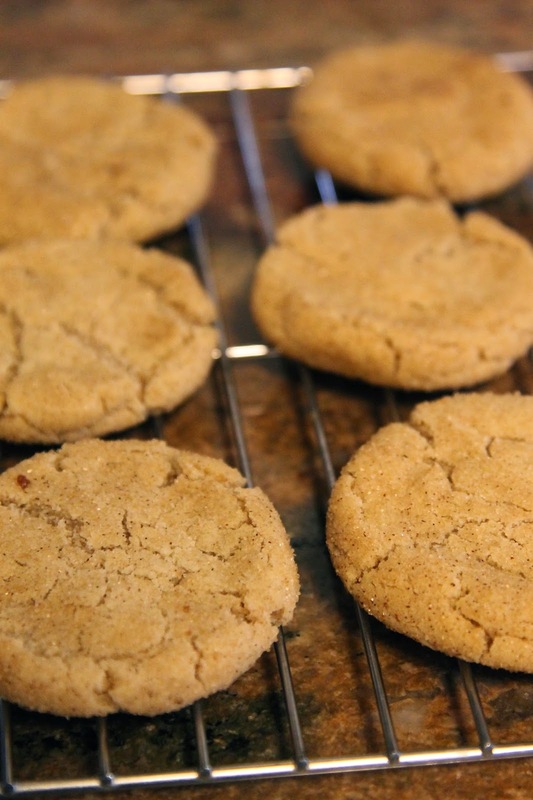 Before I could make the cookies, I was stricken with the flu and I was laid up for nearly a week. A. Whole. Week. In many regards, this was awful. Like the fact that I couldn't even get out of bed for two days. In other ways, it was enlightening; I was reminded of how wonderful my mother and mother-in-law are to me in my times of need. They came to play with Ruby and help me while I was sick. Gotta love that. Anyway, what does all this have to do with my cookies? Well, once I was better again, I sort of when stark raving cookie mad. Losing a week of Christmas joy has a way of doing that to me. So I started to bake. 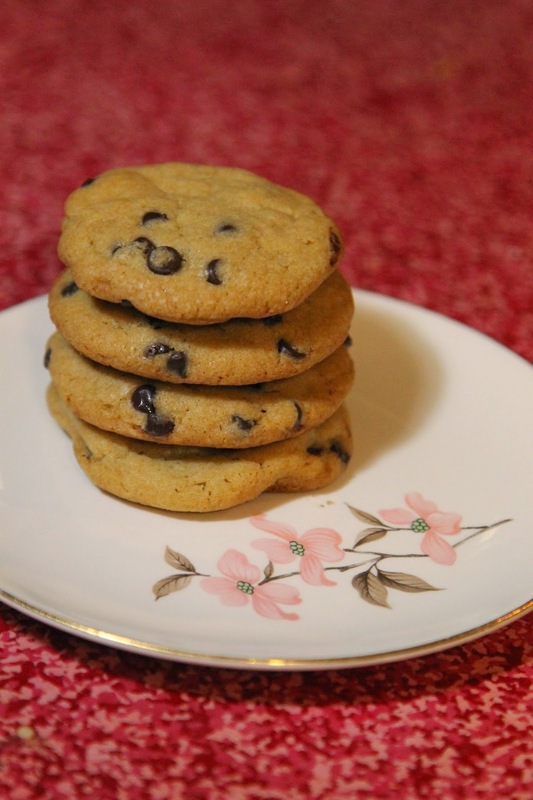 I started with those dairy free chocolate chip cookies, which my husband professed passed the test with flying colors. He said no one would ever know! I found THIS RECIPE on Pinterest. It's easy and impresses. After that, all bets were off. Basically, I used the chocolate chip cookies as a warm up round. Since then, I've made snickerdoodles (I subbed coconut oil for the butter in this recipe), at the request of my husband, and then I got crrrrrrazy and went for a Mexican Wedding Cake cookie, with a little twist: I added in some matcha! Then, just for kicks, I threw in a round of thumbprint cookies, made with my very own strawberry jalapeño jam! Let's just say that I am in freaking cookie heaven over here. If you are bit by a cookie, holiday, cheer bug and you want, for whatever reason, to keep it all dairy free, I've got your back. Heck, if you just gotta have your dairy and you wanna sub butter for the coconut oil, be my guest--I can't tell you what to do! Here is my adaptation of the Mexican Wedding Cake cookies. They are my mom's favorite, and I am really excited to share it! I think I've turned my husband onto them too, so it looks as though they may become a new tradition. In a stand mixer fitted with a paddle blade, cream together the coconut oil and half of the powdered sugar. Add the vanilla. Add the salt, flour and matcha until combined. Stir in the pecans. Form the dough into balls and lay them out on a cookie sheet (I like to use parchment paper because it's soon easy to clean up.) Bake these little suckers about 15 minutes. When you remove them from the oven, let them cool a few moments (5-10 minutes) and then roll them in the reserved powdered sugar. Let them cool completely on a wire rack. Serve with almond milk or a nice cup of tea! Well if I ever thought that getting sick was bad, I had no idea what I was talking about. Getting sick when you have a baby is worse than anything I've yet to experience. In the last several years, I've found my immune system to be stellar, but since I started breastfeeding, I've been sick twice. I wonder if there is any connection--opinions on that, anyone?! The first time I got sick was when Ruby was 3 months old. It was just a bad cold. This time, I got the full on flu; fever, body aches, and eyes that watered mercilessly making me look like I'd been crying. For. Days. With a nearly seven month old child who had just learned to crawl and pull herself to standing, this was a horrible turn of events. Suddenly I was sicker than sick and chasing around a very active baby. I needed a sick day in the worst way, but really, moms just don't get them...especially nursing moms. Thank goodness for my village. I had to call in my grandma dream team, who both brought me soup and played with my little firecracker while me and crazy drippy eyes went to bed. My husband filled in the holes between his last two weeks of school and work. My advice to moms who need desperately to take a sick day? Call in your reinforcements. People love to chip in and help, and when you need it, you need it. I held on to hope that "tomorrow" I would feel better. I was a little bitter that I lost an entire week of holly jolly Christmas plans. My Christmas shopping, wrapping, and reveling were put on hold. But at least I was able to take care of myself (for the most part). It was also a week of a lot of skipped baths and minimal family meals. But you can't win them all. What I did learn, though, were some great home remedies for nursing mothers as well as some good tricks for getting rest. So I figured I would share them in case you also find yourself in need of a sick day with a baby on your hip! Also, let's note the silver lining in this situation: that when you nurse your baby they get all the immunities they need against your illness. How truly wonderful is that?! Okay, here we go. I had no idea that fenugreek was a decongestant! I drank my mother's milk tea while I was sick and it helped (temporarily). Plus, it helped me get my fluids. I came to the party a little late on this one; really I wish I would have started it right when I got sick, but I felt it really helped break up the ick that was plaguing me! I just took a shot of vinegar and chased it with a glass of water. Make sure if you do this that it's apple cider vinegar, and frankly, make sure it's the Bragg's. The basic concept is that it helps the body become alkaline, which is a state in which infection can't thrive. I've actually used Bragg's for bladder infections in the past, but after this stint, I'm thinking of making it a part of my everyday routine. I ate a TON of Thieves (from Young Living) and I also used deep relief on my sinuses. Both helped. The Thieves felt amazing on my sore throat. Nothing better for aching muscles. Plus, bath time is a time ally to yourself. Nap time, people, nap time! Generally I put my baby in the Ergo to take a nap so I can get things done while she slumbers. But while I was sick, we took our naps in bed together and it was great. I noticed she napped longer and I was able to veg for a couple hours, which I totally needed. We may just keep this as a part of our routine! So what are your sick mommy secrets?! 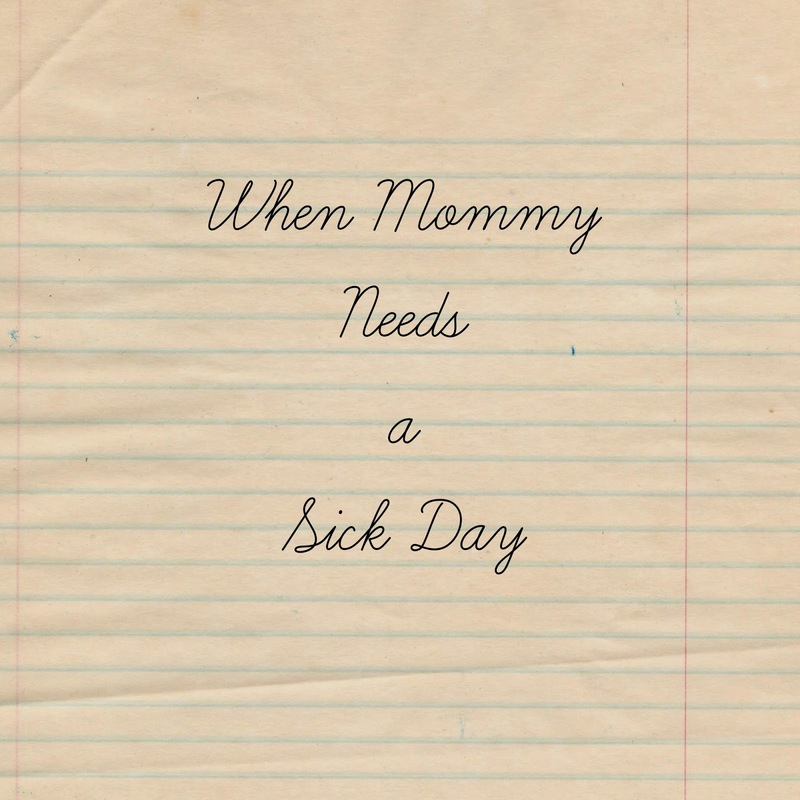 How do you help yourself when you are sick and need to be mommy? Help us all by leaving it in the comments section below! When I was pregnant, people were already asking me if I wanted more children. I cringed then, and I cringe now when people ask me about it. Even though I know it's normal. Even though I have, at times, been guilty of asking other couples or women the very same child question. I suppose it's human nature...but I can't get comfortable with it. But at least now I have figured out why, and I'm trying to get more comfortable with it. Every time I hear people say that they know they want children, or that they want more than one child, I feel a twinge of envy. Not because I want more children, but because they know. They know that they want more, or how many they want, or that they want them at all...and I've never known any of those things. As bonded to my own child as I am, I didn't know until literally the moment I decided to become pregnant if I wanted any children at all. (Even then, I am not sure I really knew.) So it should come as no surprise to anyone that now that I have a child, I'm not sure that I want any more. Still, people ask. They started asking right away, in fact, if I wanted more. My first inclination is generally to go into defense mode. I would say "no." Well, I didn't actually just say no...I said, "NO! NO! NOOOOOO!" Because to have a sense of certainty seemed somehow superior to being ambiguous about the subject. But it didn't satisfy anyone. It didn't satisfy others, (who were somehow determined to change my mind and convince me I do want more children) and it didn't satisfy me because the exchange was just so uncomfortable, not to mention inauthentic. So, I switched gears and began saying I didn't know. Which is when I realized that if you say you don't know, people take it to mean "yes." Or that you are considering it and want to discuss it--which I didn't. That is, I'm not considering it. But I can't tell the future. In my tirelessness of trying to answer this question in a way that would be less confusing, I found the real problem was that I didn't even know how to begin to answer the question. What I didn't realize at the time, but realize now, is that in order for me to be authentic with my answer, I had to be comfortable with not having an answer. Then I learned: society doesn't really do uncertainty. I literally have no clue if I want more children...there, I said it. It's that simple...and that complicated. It's not that I don't want to my child to have siblings. I just don't have an answer. I am the Sweden of having more kids. Neither for nor against, just standing in a place of neutral ground. It is this kind of neutrality that really bugs people, which is not what I am trying to accomplish at all. I wish that I could pick a side, but my guess would be that I won't until the moment I do...and who knows when or how or where that will (if ever) happen in my life. My suspicion is there are a lot of people like me out there. We are undecided, with no real notion of where we may fall on the "more kids" issue. It can be a frustrating place to be. I look at those of my friends who are having big families--who always knew they wanted big families--and I wish I could function with that sort of assuredness. I talk with my husband, who knows he would love to have another child, and I think "what must that feel like, to know in that way what you want?" There are some perks, though. One such is that not knowing helps me to stay more present for my daughter's milestones, as I think "this may be the only time I see another person say their first word, or crawl or marvel at our pets." It gives me great determination to follow through with breastfeeding (despite my panic attacks) because who knows if I'll ever do it again. It makes the time precious. It makes the hard days more manageable. But it still doesn't give me a good answer for those who come with questions. It doesn't erase the fact that no matter what I say, even if I say I am undecided, that other people will try to color the conversation with their particular feelings and philosophies. However, the farther down the road of parenthood I get, the more I realize that it is my journey in life to become comfortable with uncertainty and impermanence. How has this subject been for you? Did you always know how many (if any) children you wanted, or are you a bit like me? Share and discuss (judgment free) in the comment section below!